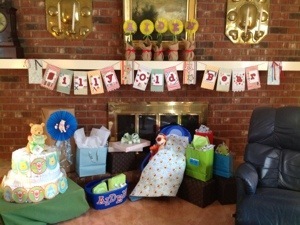 My mom, sister and I gave my nephew and his wife a baby shower. When planning a party of any kind, I think it makes it so much easier to go with a theme. Whether it be summer, garden, sports, or holiday, themes are endless. 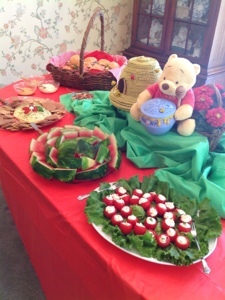 The food table was set in a Hundred Acre Wood picnic scene with gingham table cloths, rattan baskets to hold the paper plates, and lots of finger foods. 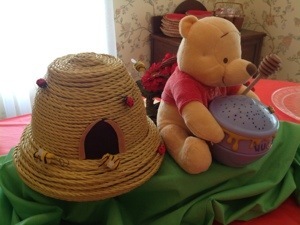 As you can see in this picture, Pooh sits upon boxes which were draped with green fabric. Large baskets held ham sandwiches and BBQ sliders. To keep with the picnic/ red color theme, there was watermelon, homemade cowboy salsa, and cherry tomatoes filled with a ranch cream cheese. 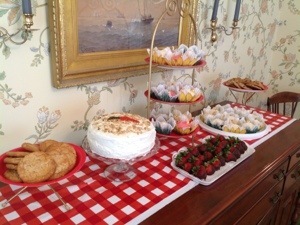 On the dessert table was an assortment of cakes, cookies and chocolate covered strawberries. We think Rabbit would have approved of the carrot cake! 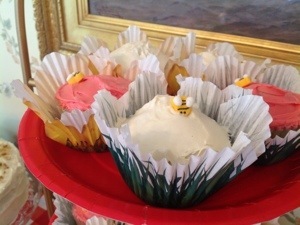 We found these adorable flower cupcake papers and candy bees at Joann’s Fabric and Crafts. My sister made a blanket for her new grandson with the Pooh motif. Tigger thinks its pretty snugly. 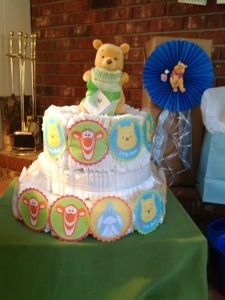 She also made this diaper cake which she wrapped a Winnie-the-Pooh banner around to decorate. The Silly Old Bear banner across the mantle was a fun craft to make. I used my Cricut to cut all the letters out and bits and pieces of scrap paper and ribbons to make the “flag” part. 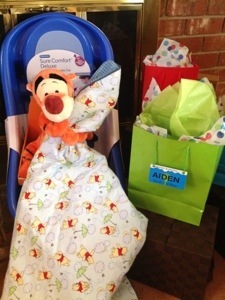 The baby’s name is going to be Aiden. We had bought these yellow paper fans from the dollar store and didn’t really know what we would do with them. 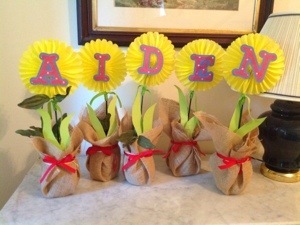 I thought they would be cute as flowers for our Hundred Acre Wood. With some styrofoam in a mason jar, that is wrapped with burlap and a ribbon, the flower is glued to a stick which stuck in the styrofoam. The leaves are cut from green paper. 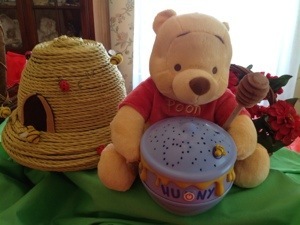 The honey hive next to bear was another dollar store craft. For $3 we made this cute hive. 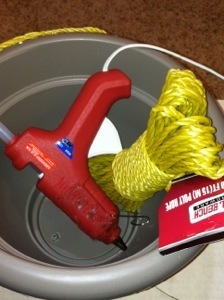 You need a plastic flower pot, glue gun and rope. 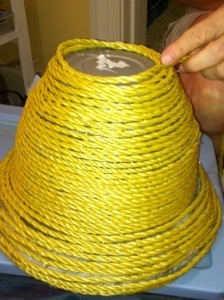 Glue and wrap the rope around the pot until covered. Have a bowl of ice water nearby for the many glue burns you will get….trust me. We cut some back and brown felt for the entrance to the hive. And added these little bees. Each bee is made by wrapping a yellow pipe cleaner into a small oval. 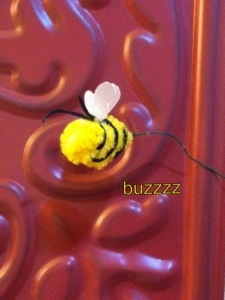 Then with black embroidery thread make the bee’s stripes and antenna. The wings are cut from vellum paper and glued in place. Too cute! 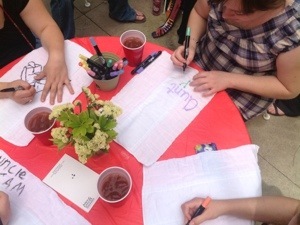 When the guests arrived, we directed them to the back patio where we had a burp cloth decorating station set up. Their friends were very enthusiastic with the task. 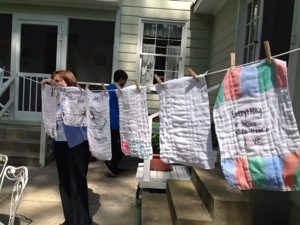 When they finished drawing, they hung the burp cloths up to dry. With a little creativity, you can host a wonderful party! 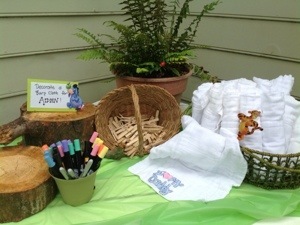 Posted on June 13, 2013 by mary •	This entry was posted in Crafts and tagged Baby shower, banner, bee hive, burp cloths, crafts, Food. Bookmark the permalink. ← Please Vote for Me! Adorable!! So glad to see the pics! It was fun to put together!